From the pocket miscellany (Add.MS.27261), with its exquisite miniature illuminations, compiled in 1410-11 for Timur's grandson Sultan Jalal al-Din Iskandar, ruler of Fars, to unique historical documents and literary manuscripts, the Persian Manuscripts collection at the British Library is one of the most significant collections in the world in both size and importance. Consisting of over 11,000 works in almost as many volumes, it combines the two world-class collections of the British Museum and the India Office Library. These manuscripts originate from the whole of the Persianate world, in particular Iran, Central Asia and India and range in time from the 12th century to recent years, representing most of the traditional fields of humanities and religious studies. Many of the Persian manuscripts are copies of rare texts, with examples of some of the finest illustrated Mughal, Timurid and Safavid paintings. The British Library is now in Phase 3 of a program to enable digital access to the Persian collections. The project involves creating catalogue records for uncatalogued manuscripts, standardizing existing print records and creating digital files to make them available online. At the same time we are digitising and putting online some of the most significant manuscripts in the collection. During the first two phases, in partnership with the Iran Heritage Foundation and other supporters, we digitised 50 manuscripts and completed the cataloguing of all acquisitions made after 1903. In this third phase we are focussing on cataloguing the Persian manuscripts that were formerly part of the Mughal Imperial Library, Delhi, which were transferred to the India Office Library by the Government of India in 1876. To date we have digitised 89 manuscripts which are available, cover to cover, at the British Library's Digitised Manuscripts (see list below for details). This includes 34 Judaeo-Persian manuscripts which have been digitised as part of the on-going Hebrew Manuscripts Digitisation Project. Our completed catalogue descriptions are being uploaded to the Library's own online catalogue of archives and manuscripts and additionally details of over 2,500 works are searchable on Fihrist, a union catalogue of some of the major Arabic script manuscript collections in the UK. Our posts '15000 images of Persian manuscripts online' and 'Twenty more Persian manuscript treasures online' give a general description of the project with examples of the images, and several other blog posts describe manuscripts digitised as part of the project (search for 'Persian' in the search box on the main blog page). Our Judeo-Persian manuscripts have also been digitised as part of the Hebrew Digitisation Project (search for Judeo-Persian on the Digitised Manuscripts page). We have also published digital copies of over 1,500 previously unpublished descriptions of Persian manuscripts in the India Office Library compiled in the 1930s by C. A. Storey, A. J. Arberry and R. Levy. Details and guidance on how to use the catalogue are given in our blog: A newly digitised unpublished catalogue of Persian manuscripts. Details of a further 76 works on Qur'anic literature which were printed but never published are to be found in a subsequent blog: A newly digitised unpublished catalogue of Persian manuscripts: postscript. We are currently seeking further funding to complete the current phase and to create digital records for all the manuscripts described in the groundbreaking catalogues of the late 19th century and early 20th century by Charles Rieu and Hermann Ethé. We also aim to digitise further selected Persian manuscripts. If you would like to support us or can help in any way please look here for more information. Below we have listed the Persian manuscripts in the British Library which have been digitised up to the present time. Click on the manuscript number at the head of each description to go directly to the relevant entry on the British Library's digitised manuscripts site. Once there, click on the thumbnail image of the manuscript to get to the full digitised version which will open in a new window (please note that all subsequent digitised manuscripts that you view will appear in this same window). You can choose to view one page at a time or two together in book format (i.e. as if you were reading it). Make sure, however, that you select 'Right to Left' in the 'Direction' box. Also included in the list below are links to catalogue descriptions, blog posts and other related documents for each manuscript, where available. If a manuscript is illustrated, the description will contain direct links to the illustrations. The list will be updated regularly to reflect ongoing work. Add.6613 of our printed catalogue becomes Add.MS 6613. Reg.16.B.8 similarly becomes Royal MS 16.B.viii. To keep in touch with new developments and current research, please subscribe to our blog and follow us on twitter @BLAsia_Africa. 2) Bahmān ibn Kaiqubād. Qiṣṣah-’i Sanjān. Blog: What were the Mughals favourite books? Sayyid Muḥammad Mūsavī Vālih. Kabūtar nāmah, an illustrated work on pigeons arranged here as two separate works with the same title, dated 24 Sha‘ban 1202 (30 May 1788). Contains 13 paintings in addition to illustrated panels depicting pigeons. Gulbadan Begam, Aḥvāl-i Humāyūn Pādshāh. Autobiographical account of the reigns of the Mughal Emperor Bābur and his son Humāyūn by Bābur’s daughter Gulbadan Begam (1523-1603). Although this copy probably dates from the early 17th century, it is the only known copy to have survived. A collection of epic poems. Shiraz?/Timurid style, 800/1397-8. 11 miniatures, 3 illuminations. Poetical texts in Judeo-Persian, 1702. Paper, 349 ff. Blog: What were the Mughal’s favourite books? 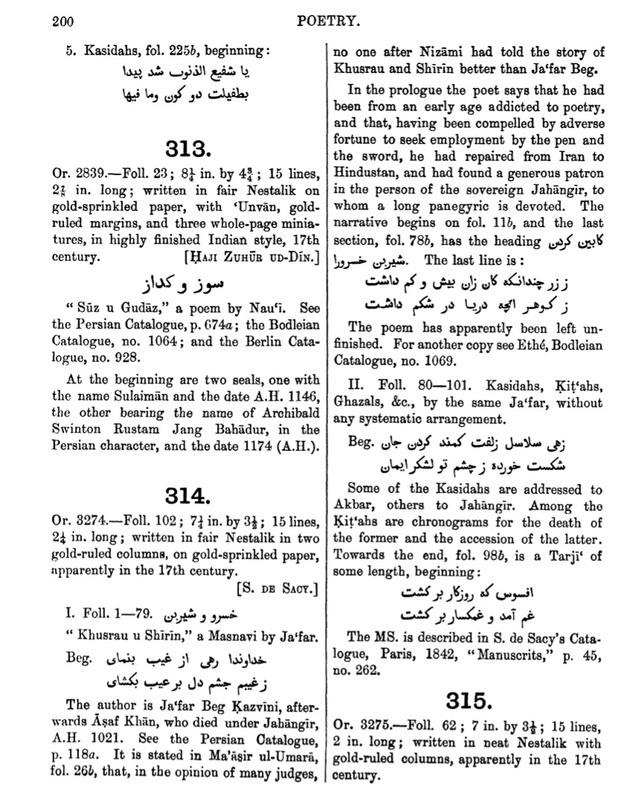 The 'Yazd Anthology', a collection of Turkish works written in calligraphic Uighur script in Yazd in 1431 with the addition of the Persian Dīvāns of Kamāl-i Khujand and Amīrī in the margins. The Uighur scribe was Mansur Bakhshi who was working for Mir Jalal al-Din the governor of the city. Ornamented throughout with geometric floral and other designs. Anthology of Judeo-Persian poems, 1775-1825. Paper, 80 ff. Collection of Judeo-Persian poetical works, 1898. Paper, 83 ff. Article: J. P. Losty, “The ‘Bute Hafiz’ and the development of border decoration in the manuscript studio of the Mughals”, The Burlington Magazine 127 no. 993 (Dec. 1985), pp. 855-56; 858-71. 1) Zartusht Bahrām Pazhdū. Ardā Virāf nāmah. The story of Arda the Just's visit to Heaven and Hell.